A Different Bin, a Different Company! Our mission is serving our customers and growers with honesty, integrity and truth. CMC has always been a supplier of exceptional products and a leader of equipment that yields quality grain in the industry. We have taken this same approach to service with an emphasis on quality workmanship. At CMC we build different. 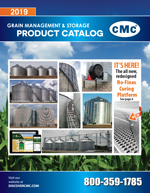 We know that grain management and storage products are a large investment for our customers. We take it seriously and want our products to be a success for years to come and generations to follow. Keys to making our systems successful are not only using quality products, but having standard practices in place for our contractors to follow. Today’s standards are built from 30 years of design and construction experience. CMC only uses engineered towers on all of our loop systems and leg applications. We want to make sure our systems are designed to handle all weather events including areas of ”high wind or hurricane zones”. Chalk lines are snapped to make sure the floor supports are correctly spaced. If floor support spacing is not correct, you can experience too much weight on the supports allowing them to fail or poke through the floor plank, ultimately leading to your floor collapsing. Some companies will skimp on the amount of floor supports they sell with your bin to get a lower price- a recipe for disaster. Placed inside the bin and under the floor to make sure you have an air-tight seal. This way, as the fan blows into the bin, the air will pressurize under the floor, maximizing the amount of air traveling through your grain. The sealant is out of the weather where it will last longer. This is standard on all TenFold™ Bins. All fan transitions and face plates are bolted rather than tec screwed. Bolts secure these applications in place for years of quality performance. These are just a few of the key differences followed up with a Quality Check by a CMC representative upon completion of your project. We want to be sure your project is done correctly and everything is installed in accordance to our standards.